In this work, poly-ε-caprolactone samples are modified by an atmospheric pressure plasma jet in pure argon and argon/water vapour mixtures. 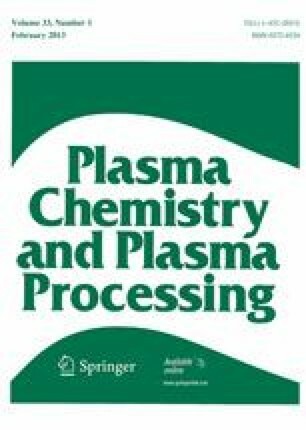 In a first part of the paper, the chemical species present in the plasma jet are identified by optical emission spectroscopy and it was found that plasmas generated in argon/0.05 % water vapour mixtures show the highest emission intensity of OH (A–X) at 308 nm. In a subsequent section, plasma jet surface treatments in argon and argon/water vapour mixtures have been investigated using contact angle measurements and X-ray photoelectron spectroscopy. The polymer samples modified with the plasma jet show a significant decrease in water contact angle due to the incorporation of oxygen-containing groups, such as C–O, C=O and O–C=O. The most efficient oxygen inclusion was however found when 0.05 % of water vapour is added to the argon feeding gas, which correlates with the highest intensity of OH (X) radicals. By optimizing the OH (X) radical yield in the plasma jet, the highest polymer modification efficiency can thus be obtained.